Myanmar is my favorite country in Southeast Asia - out of those we've seen so far. It's less touristic, way more friendly than Thailand, we haven't been victims to any con artists and it boasts amazing, world's class archaeological gems, just like Angkor Wat in Cambodia. Myanmar is similar to India, however a bit less polluted (with the exception of the terrible air pollution). Expect a big adventure when you go out and travel the local way. While visiting the majestic temples of the ancient city of Bagan in Myanmar, tempted by extraordinary photos and encouraged by the previous, amazing hot air balloon experience in Cappadocia, Turkey (take a look at my post about it), we decided to go for it and pay the extremely high price for the Balloon over Bagan flight. You live only once, after all. Not everyday you're in Bagan and can try something so unique - combining the air balloon flight with the overview of the whole magnificent area - miles and miles of land dotted with hundreds of various temples. All this in the warm rays of the rising sun. Sounds amazing, doesn't it? But in the end, was Balloons over Bagan really worth it considering the price? Mandalay is the second largest city (after Yangon) in Myanmar. Similarly to Yangon, it also used to be the country's capital and has retained the royal splendor until this day. Surprisingly, although Mandalay feels way older than Yangon, it was established as late as the 19th century. Nevertheless, even though the most popular pagoda in Myanmar (the Shwedagon Pagoda) is located in Yangon, I preferred the authentic feeling and the overall Burmese atmosphere of Mandalay. Less modern high-rise blocks, more spectacular temples, palaces and piece-of-art wooden buildings. Less organized, more messy, chaotic and hectic - but in the positive sense of the word. Old Bagan is one of the most famous archaeological sites in South East Asia. Often compared to the Angkor Wat Complex in Cambodia, Bagan was open to the tourists relatively recently. 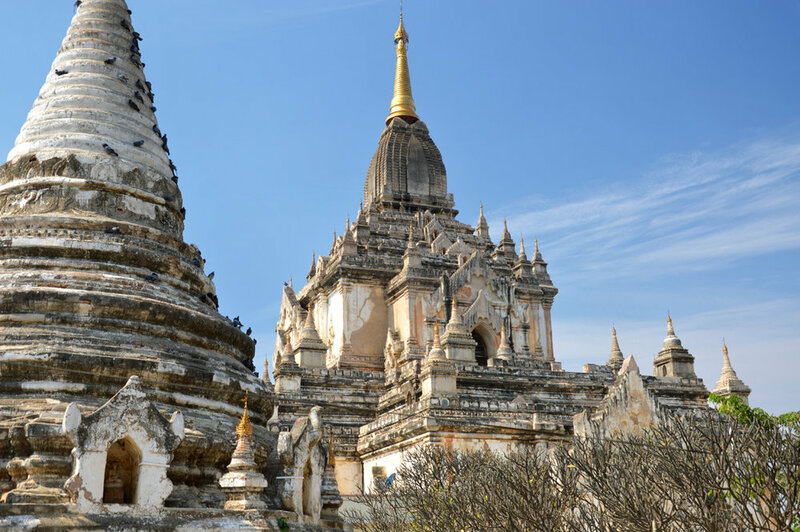 Although Myanmar is still regarded by some as an off the beaten path destination (for example, there are not that many foreign visitors in Mandalay or at the Golden Rock Pagoda), the magnificent temples of Bagan attract hundreds of travelers every day. Nevertheless, just like Angkor Wat, the pagodas in Bagan are spread around such an enormous area that you'll still feel the uniqueness and remoteness of this extraordinary site. 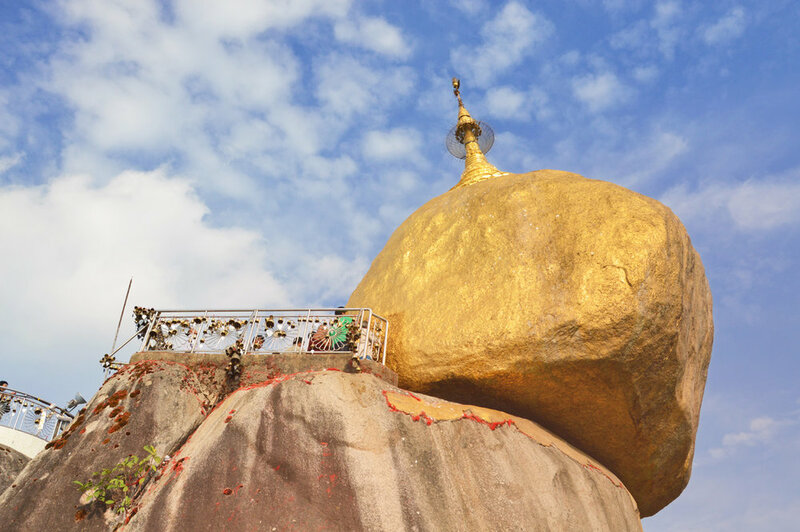 One of the most important religious sites in Myanmar, seemingly defying the law of gravity - Golden Rock Temple (Kyaiktio or Kyaikhteeyoe Pagoda), although quite famous, is surprisingly not as touristy as the other destinations in the country - Bagan, Mandalay or Yangon. There are good and bad sides to it. The good thing is that the authenticity of the place is still preserved (unlike the temples in Thailand) and you'll see many more locals than foreigners around. The bad thing - to get there without an expensive, privately run tour or a taxi is pretty complicated, the bus schedules are not clear and the level of English among the Burmese is very low. And... to be honest, the site is one of those that look absolutely spectacular in the photos, a bit less so in real life. Having said that, the whole journey was a great adventure, definitely worth the effort and it left some priceless memories in my mind.